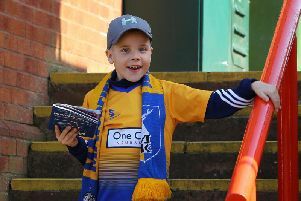 Adam Murray believes Mansfield Town have unearthed a real gem in new recruit Jordan Wheatley after the teenager signed from Ilkeston FC this week. Wheatley, 17, has come through the highly-acclaimed academy at Ilkeston and was a key part of not only the first team squad last season but also the team that reached the third round proper of the FA Youth Cup where they were narrowly beaten by Newcastle United. And having given Wheatley his first run-out in a Stags shirt at Rainworth Miners Welfare on Saturday, manager Murray is keen to see the versatile youngster develop into a first team player. He said: “He’s a real talent who we’ve had our eye on for a while. We’ve done really well to get him because he came very close to joining a Championship club last year and there have been others really keen on him, so I’m delighted. No details have been released regarding any fee paid for Wheatley, but although he turned down a new offer to stay at Ilkeston it is understood the Robins will be due compensation due to the player’s age. Doncaster Rovers had two bids for Wheatley turned down in January.